Bunny Run 2 follows the same story as the original game, as you control a jumping bunny through 15 adventurous levels. It features graphics with a cartoon-like touch and alongside the one-tap controls it is a game suitable to be played at any age. Help the bunny hop its way through dozens of enemies and obstacles while collecting coins and powerups. Fun platformer gameplay. Help the bunny by tapping to jump over enemies while trying to collect coins. 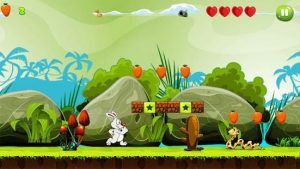 Enjoy a classic platformer gameplay with 23+ enemies from the animal kingdom, obstacles of all sorts and a restless bunny. Easy controls. You control the bunny with a simple tap-to-jump. This makes it suitable for users of all ages, from kids that love bunny cartoons to adults looking for a break. Multiple long levels. There are 15 different levels spanning over 3 deadly worlds. Each level will show the progress and introduces new elements. Gather enough coins to earn 3 stars at the end of a level or replay to perfection. In-game powerups. You only have 3 lives but can collect more during your run, as well as powerful power-ups such as riding the king of the jungle. Beautiful graphics. The game has a cartoon-like vibe that children will love. Graphics are beautifully-crafted to match the cartoon theme and the game is accompanied by a matching soundtrack.